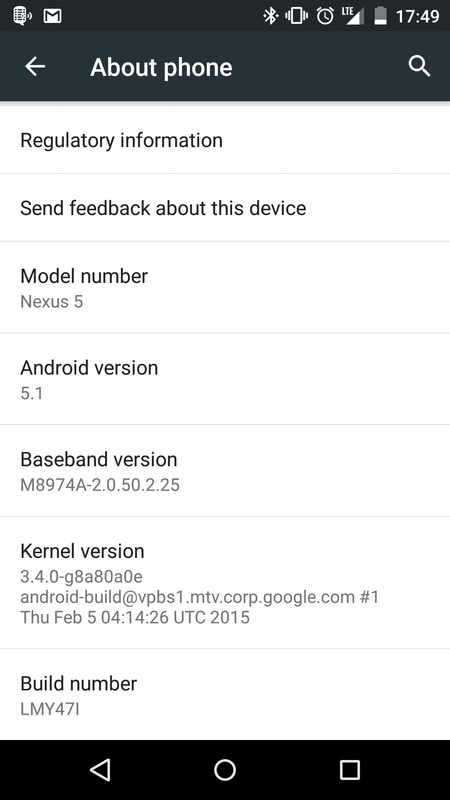 Chronicles of Nushy: Android Lollipop 5.1 R3? Yesterday while going through the Google Plus news, I came across an article posted by PocketNow.com stating that Google had released a newer update for the Nexus 5: build LMY47I. I do not know or do not care whether other phones have received the same update, though. Today, Saturday the 28th of March, just before going out on a one day trip with my family, I decided to upgrade the OS to this latest version. Just like the previous two occasions, I referred to this tutorial to update. It went fine without any issues this time as well. Phew! Now I think I am confident in manually upgrading the firmware on my Nexus 5. I might upgrade my wife’s phone manually as well. But before doing so, I need to use this version for a couple of days and make sure that it doesn’t have any significant bugs in it. The last thing I need is to receive a call from my wife while I am at work, telling me a particular feature doesn’t work as before any longer. I was in dilemma whether to side-tear (would be my first time) or clean install the OS. After giving it some thought, I decided to do a clean install this time around as well. This is because I wanted to get rid of all the old – buggy – stuff from the previous version of the OS that I had been running in the last couple of weeks. I wasn’t all that pleased with the stability and performance of Android 5.1, hence I believe this build is there to make things right. But without thorough testing, there is no way to tell how better this build is. At the time of writing this post, I've finished using it for one charge cycle. So far it seems to work as expected. I mostly used the Google Maps, Viber, Facebook Messenger, Dropbox, Player FM and Chrome apps and SwiftKey for the keyboard. Of course a couple of apps crashed - not the ones mentioned above - during the initial setup phase. Those apps probably need updates and should not come to any conclusion about the stability of the OS based on that. Only time will tell if the memory leak issue has been fully resolved, as it may take a couple of days of uptime to show its effects. I'll update this post if I find out a significant issue with this build but I hope I won't find any. Was switching to a SFF gaming PC worth it?